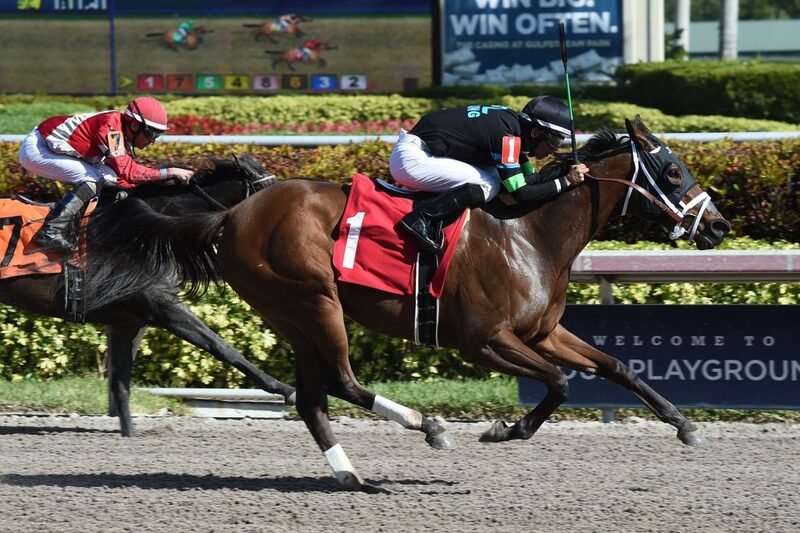 Blacktype-placed ALTER MOON was too much for her competition and trounced an allowance field by 14 3/4 lengths racing 6 1/2 furlongs at Gulfstream Park. The 3-year-old filly by ALTERNATION had early pressure on the lead, then disposed of that one on the turn and ran away from the field to be wrapped up at the finish. In her last out, ALTER MOON finished runner-up here in the Game Face S. less than two lengths off the win, but nearly 15 lengths in front of the third-place finisher. A Maiden Special Weight winner here in her seasonal debut (pictured), ALTER MOON was a $55,000 Fasig-Tipton Kentucky October 2016 Fall Yearling Sales purchase. Lifetime record: 6-2-2-0, $82,220. O-JAL Racing. B-C. Hunter Hager and E. Claire Hager. T-Jose Velez.